On a whim, we picked up a couple of small filets at the grocery store, and I pan seared them for us. The last time I tried cooking steak this way, it ended up burned on the outside and raw on the inside, so I looked up a recipe this time. Turns out that my main mistake was that I didn’t fill the pan with a quarter cup of oil. I found a description of how to go about steak searing, and it included a more detailed recipe as well. The basic method is simple, just heat the oil on high until it starts smoking, then cook the steaks, flipping and basting regularly until they’re about 5 degrees cooler than you want, and then rest them for a few minutes. The recipe also included details like salting the meat beforehand, and adding aromatics and butter to the oil. But really, the copious amounts of hot oil covering all sides of the meat are the important part. The steak was delicious, and I’ll definitely be using this method again. We were originally going to make a chicken-stuffed pumpkin, but didn’t end up having any bread ready in time. Rather than put dinner off until about 10:00 at night, I improvised a chicken stroganoff based on my family’s beef stroganoff recipe. I had a previously-cooked chicken in the fridge (using this recipe), so I used the wings and leg quarters, saving the breast meat for Sarah’s sandwiches. Heat butter in a large pot on med-high heat. Once butter is sizzling hot, add mushrooms and onions. Cook until mushrooms are have started releasing their delicious liquids, about 5 minutes. Crack on some pepper, and add egg noodles, pan drippings/stock, and wine. Lower heat to medium-low and cover. Cook until noodles are soft and liquids are absorbed, about 10-15 minutes. Remove from heat, then add sour cream and stir until creamy. 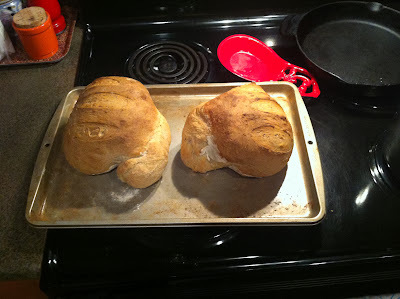 This is a bread recipe we’ve used a few times when we want to bake a loaf while the rest of dinner cooks. It’s very amenable to substitiutions and flavor alterations, and it comes out dense, moist, and flavorful. Add all liquids, and stir to combine. 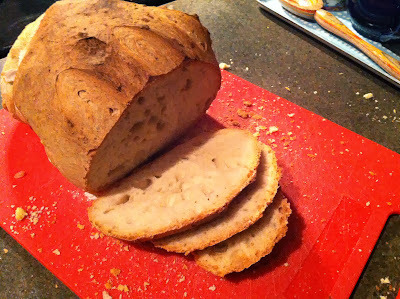 Shape into a loaf, place on a baking sheet, and score the top. 10 minutes before the bread is done, spread some butter on top to help it brown. You are currently browsing the Home of the Ghostlords archives for November, 2013.